The Nintendo 3DS is a powerful multitasking beast, besting the efforts of many handhelds and consoles before it. If you don't want to quit out of your game, you can use one of the four highlighted icons to perform additional tasks on top of your game after pressing the Home button. For example, want to jot down some important notes during a game? Don't ruin the last few pages of your instruction booklet. Instead, tap the pencil icon to access Game Memo, an app that lets you draw and write anything you want. (It looks a lot like Pictochat.) Once you're done, you can save your image to the SD card. Is your system notification LED flashing orange? That means one of your Wi-Fi connected friends is online. Tap the smiley face button to see what your friends are playing. 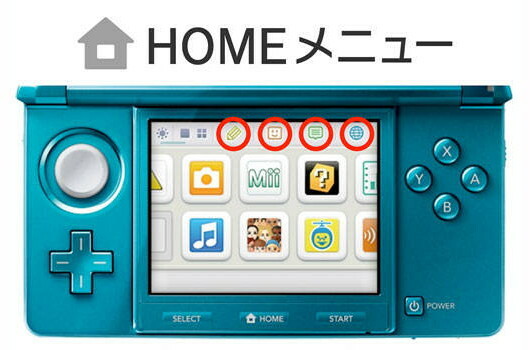 The speech bubble icon will give you insight into all of your Spot Pass and Street Pass activity, letting you know when you've downloaded something new. Finally, the internet browser (available via firmware update) should let you research some GameFAQs and read some Joystiq while you take a break from raiding some faces. Overview : Finally a way to charge all your valuable electronics with one device! Introducing the Multi-Charger from XCM. This unit will charge your iPhone, PSP (all PSP series from 1000-3000 series), Xbox 360 Wireless Controller, PS3 Wireless Controller, NDS (all NDS series, including NDS, NDSL and NDSi) and more.... (all devices using USB 5v input will be supported, such as the Nokia mobile phone series etc) with ease. No more lugging around multiple chargers, this one does it all. Made with the high quality craftsmanship you've grown to expect from the XCM brand, this charger will surely provide the power you need for many years to come! Quality/Usability : I must admit, I'm a gadget freak. I have surge protectors daisy chained to each other. There just isnt enough outlets! I'm surprised my house hasnt burned down with all these wires. If I find an open slot in my surge protector, I'll charge my DS, PSP, camera battery, cellphone..thats if I'm lucky to find 1 spot. If I cant, I use my USB port on my computer. Now, my USB ports are starting to become scarce as more portable devices start to use them. Yes, you can purchase a USB hub but majority of the time, they arent powerful enough to charge the device and you get an error message on your computer. Even the ones that come with power plugs gives me an error. XCM has released a stand alone Universal USB Multi-Charger. No need to plug this charger into a computer or USB port. Choose your AC plug and connect plug it into a socket (AC 100-240V) and the other end into the Multi-Charger. The Multi-Charger has a square glossy white casing with a small LED light that lights up when plugged into outlet and the logo on top. The logo uses a Walt Disney type font. On the front of the Multi-Charger are 4 USB ports. Since it draws its power from the socket, you wont have to worry about overdrawing power or having to wait 5 hours to fully charge a device when it should only take 1 hour or so. The Multi-Charger measures 5 inches long, 4 inches wide and 1.5 inches thick and comes with four (4) AC plugs (US, EU, UK and Asia). The plugs are short in length so you will not be able to place it on a table or next to your computer. Wires measure about 16 inches long from tip of plug that inserts into XCM Multi-Charger to the base of AC plug (not the prongs). Also included are four (4) USB plugs (PSP, DSL, DSi, iPhone/iPod). You're not limited to using only these devices. I was able to charge my Blackberry device, Bluetooth headset, PS3 controller, Xbox controller, USB battery, pretty much anything I can think of that uses a USB to charge the device. The charge time is about the same time it would take if you use the OEM (Original Equipment Manufacturer) chargers that came with the device. Conclusion : Overall, the XCM Universal USB Multi-Charger is a great product. I do not have to use all my USB ports nor do I have to leave my PS3, Xbox 360 or computer on just to charge my USB devices. Since some wall chargers are huge and can cover up an empty socket, this also eliminates the amount of wall chargers and bulk. I was able to charge all my devices without a problem. My only complaint is the lack of cord length on the AC plug for the Multi-Charger. I was not able to place the Multi-Charger on a desk. I had to place it on the floor. This is also a drawback for those who need to plug this in the back of a shelf or entertainment center. You can use an extension cord but do you want to go out and buy one or even find one in the house? The price was originally $70 but it was wayyyy to overpriced for a 4-port USB charger. But it seems XCM has lowered the price to a much more affordable price range. However, $40 is still a little pricey. I think $25-30 would be a nice sweet spot. Work is underway on a new Super Mario Bros. game for the 3DS, Nintendo lynchpin Shigeru Miyamoto has confirmed. Speaking in a new Iwata Asks interview on the platform holder's official site, Miyamoto announced, "In the interests of adopting new technology for the Super Mario Bros. tradition, I am now making a new Super Mario Bros. game for the Nintendo 3DS system." No further details were offered but, referencing a comment from Mario co-creator Takashi Tezuka regarding how Mario games must always be family friendly, Miyamoto added that every entry series needed new elements. Presumably the plumber's 3DS incarnation will be no different. "I think Tezuka-san is exactly right about making something that families can enjoy together," he explained, "but I also think it's important to always use the most advanced technology for Mario in order to create something no one has ever seen before. "Of course, it's important to make sure people still say things like "Falling down the holes is the most fun!" but something new is necessary for other aspects of the games, and it's those new elements that make a Super Mario Bros. game what it is. " Mario's last 2D outing, 2009's excellent New Super Mario Bros. Wii, successfully bolted cooperative and competitive multiplayer onto the series' core platforming formula, helping the game win a 9/10 from Eurogamer's Oli Welsh. Miyamoto didn't reveal how long we'd have to wait to find out what the 3DS iteration adds to the franchise, but he seemed pretty pumped about it, insisting "I want to show everyone as soon as possible what the new Super Mario Bros. will be like on the Nintendo 3DS." Drivers who regularly play videogames are nearly twice as likely to be stopped by police while on the road, according to a new study. The survey, carried out by Continental Tires and reported by Jalopnik, polled 2000 motorists between the ages of 17 and 39, half of whom were regular gamers, about their driving habits. The results showed, among other things, that 22 per cent of gamers have been stopped by police, compared to 13 per cent of non gamers. 31 per cent of gamers claimed to have run a red light, compared to 14 per cent of non gamers, while 30 per cent had claimed on insurance for an accident, as opposed to 15 per cent of the non-gaming population. That said, it seems gamers are more likely to pass their driving test first time out and suffer fewer prangs. So, where are all those Gran Turismo 5 fans going wrong? "It seems that while gamers develop useful skills and are more confident, they need to apply some balance with a sensible assessment of risk," said Continental's Tim Bailey. Peter Rodger from the Institute of Advanced Motorists chimed in too, offering the gaming populace a firm finger-waggling. "I am not surprised that regular gamers find themselves making the same decisions and judgements when driving for real as they do when in the virtual world," he said. "The issue is that when actually driving, our actions lead to 'real' results, and mistakes have very real consequences." Nintendo president Satoru Iwata has set the record straight on the launch of the 3DS eShop - it won't be ready for the launch of the new handheld console. The eShop is Nintendo's digital marketplace for the 3D system, offering demos and trailers, as well as retro titles and DSiWare games. "The first system update is scheduled for late May, at almost the same time around the world," he told a recent investor conference. With the console going on sale in February 26 in Japan and March 25 in Europe, early adopters won't have access to the service for two or three months. Nintendo had originally said that although the eShop and web browser would not be included in the console, an update to add the features would be available on day one. Iwata admitted that previous digital services on the Wii and DS have not been marketed well, and the eShop will be another attempt by Nintendo to improve its digital distribution methods. "So far, Wii Shop Channel and Nintendo DSi Shop, which are based on internet-browser technology, have not provided the users with a sufficiently easy and accessible interface because switching from one screen to another takes time and, for Wii, promotions by Nintendo Channel and sales at Wii Shop Channel have not been closely linked," he detailed. "As it is critical in digital software distribution that the software available there won't be buried and go unnoticed, and that we can prepare pleasant encounters for consumers, we will be running a drastically redesigned shop for Nintendo 3DS in which you can more comfortably purchase software through downloads." "To Nintendo, social elements are nothing new at all"
Nintendo believes its history of multiplayer gaming features predates and is equivalent to the current interest in social network games. President Satoru Iwata told investors last week that "It has been reported that social entertainment is the key to video games... Nintendo has been developing social entertainment in the field of video games for a long time. "Social elements tend to be narrowly associated with human relationships through computer networks. We believe, however, that the essence of social entertainment is that the relationships with other human beings add a social nature to the play and make it more interesting. Although Iwata appeared to be addressing the growth of titles such as FarmVille and Japan's phone-based MobageTown, he saw parallels with Nintendo in that "NES had two controllers from the start and Nintendo 64 was the first home console system to make four controllers available. "The link cable for GameBoy allowed two players to compete in Tetris and later enabled the trades and competitions of Pokémon, and gradually these features were made available wirelessly. To Nintendo, social elements are nothing new at all." He observed that "When you hear the term 'social network,' it generally means a service taking advantage of social human relationships through a constantly connected network with smart phones and PCs. In contrast, Nintendo appreciates real human relationships among people." The 3DS' StreetPass and SpotPass features, which automatically arranges and even plays games with passers-by, played a part in Nintendo's ongoing social game strategy, he claimed, as well as "further expand[ing] the gaming population." The company perhaps seems a little less interested in fuelling its social systems with download-based gaming however, having just announced that its eStore for 3DS has been pushed back to May.